Bitumen will not flow unless heated or diluted with lighter hydrocarbons. At room temperature it resembles cold molasses. Bitumen makes up about 10 to 12 per cent of the weight of the oil sands found in Alberta. The remainder is 80 to 85 per cent mineral matter – like sand and clays – and 4 to 6 per cent water. Canada has the second largest reserves of oil in the world, after Saudi Arabia. 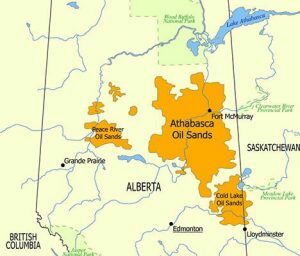 Only 13 per cent of the world’s known oil reserves– one in six barrels – is considered freely accessible to international oil companies, and half of this oil is found in the Athabasca oil sands. The Province of Alberta sits on proven oil reserves of 179 billion barrels, 97 per cent of which are located in the oil sands. Oil sands are found in northern Alberta beneath approximately 140,000 square kilometers of land, an area larger than the Island of Newfoundland or the State of North Carolina. However, only 2.5 per cent of this area houses oil sands located close enough to the surface to be mineable. The bitumen contained in the remainder of the area must be produced using in-situ technologies. 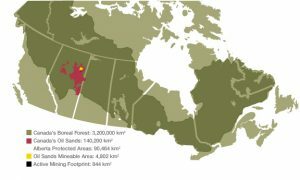 In more than 40 years, oil sands mining has disturbed approximately 530 square kilometers of land, or about one hundredth of one per cent of the Canadian boreal forest. According to the Government of Alberta, there were 91 active oil sands projects in Alberta as of January 2009. Of these, five are mining projects and the rest use various in-situ recovery methods. There are three deposits of oil sands in Alberta. The largest and most shallow deposit is the Athabasca oil sands area, located near Fort McMurray. The Athabasca is the largest deposit and is the site where all current mining projects are located. The Cold Lake deposit is the second largest and contains only in-situ projects. The Peace River, Wabasca and Buffalo Head Hills deposits have seen slower development due to the technology required to access the resource. This area is known as the Carbonate Triangle and much work is underway to make resource development in this area technologically and economically feasible.